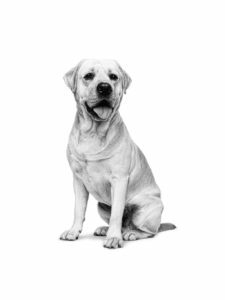 Home » Articles » What Are the Differences between the Golden Retriever and the Labrador? There are noticeable differences between each breed’s build. The Golden Retriever’s average adult height is slightly higher than the Labrador due to their slightly varying bone structure – resulting in a taller and leaner build. Labrador Retrievers tend to have a stockier build and are more prone to obesity than Golden Retrievers, this is because of the subtle difference in muscle mass percentage. A Labrador Retriever’s fur is unique – it consists of two separate layers. A Labrador’s coat has a soft, thick under-layer, which insulates the Labrador from cold temperatures. The outer layer of a Labrador’s coat is oily and coarse, which is why the Labrador’s fur is very water resistant. Golden Retrievers usually have long, thick fur that is not as resistant to moisture as the Labrador Retriever’s fur. A difference that’s easier to spot is the difference in fur colours. Both the Labrador Retrievers and Golden Retrievers each have unique fur colours that are specific to their breed. Labrador Retrievers are usually Yellow, Chocolate, or Black. Occasionally, Silver, Charcoal or Grey are possible, but these are rarer occurrences and are not strictly part of the breed standard. The Golden Retriever’s fur can range from a reddish brown to a light golden colour, although generally a Golden Retriever’s fur is a mid-range Golden colour. Both Labrador Retrievers and Golden Retrievers are renowned and loved for their equally excellent temperaments. However, while a Labrador Retriever is more predisposed to being energetic, active, and enthusiastic, the Golden Retriever is much more likely to be have a relaxed demeanour. The Labrador Retriever and the Golden Retriever both shed to a moderately high extent. However, because the Golden Retriever has a longer coat, additional grooming attention is required. Golden Retrievers are also more prone to fur mats (tangled fur that creates “lumps” in the coat), and ideally should be groomed each day to prevent them occurring. Labrador Retrievers, on the other hand, only need to be groomed 2-3 times per week. Both breeds can be prone to skin sensitivities and benefit from a diet formulated to help support skin health. Veterinary advice should be sought if symptoms of skin problems are seen.